Today I'm sharing with you a guest post written by Schledia Benefield, author of Wildflowers. Check it out! Thank you, Isabel, for inviting me to your blog. There have been stories floating in my head as far back as I can literally remember. As a small child my mind was always wandering to faraway places. I had a very active imagination. Sitting in the middle of my grandparents’ yard, I would pick flowers, tie them together, and create a crown for myself. The princess of the enchanted woods should have a crown, shouldn’t she? I can say with all honesty at that point in my life, I never imagined that I would write books one day. To me, those stories were simply a way to escape to another world, and I assure you, it wasn’t that my world was horribly bad. As a very small child, we lived with my grandparents due to the fact that my mother was bedridden after having my baby brother. Blood clots hit her lungs causing her to go into heart failure. My dad worked two, sometimes three, jobs, so he couldn’t take care of us, so my parents sold their home, and we moved in with my mom’s parents. My grandmother took care of me, my brother, and my mother while my dad worked. My aunt and uncle and my two cousins lived next door, so I didn’t lack for relatives to play with, but I still preferred being to myself and my imagination. After I got into the upper elementary grades, I began writing short stories from some of my adventures into magical worlds. It was at that point that I wanted to actually write down the stories in my head, but I still didn’t dream of ever becoming an author. I just wanted to write down the stories I imagined for myself. I would have never allowed anyone to read them other than my two best friends. They were a little more ambitious than I was and even talked me into starting a local one page paper. We would cut out pictures from magazines and write articles about the latest jelly bean shoe fashion or the diaper shorts we wore! Ah, the memories. When I got to junior high, I started writing poetry. I never considered any of them to be any good, but I enjoyed the thought that had to be put into them. I actually started to write several different books during my junior high and high school years, but I feared rejection, so I never finished them. Stories were honestly always in my head; I couldn’t escape them even if I wanted to, but the truth be known, I did not want to escape from them. They compelled me and pulled me into their worlds. All it took was for me to see a scene being played out at school or in a television show and my mind was racing with a different scenario. Life it seemed was my inspiration. I still indulged the fantasy worlds of my childhood, but real life situations sparked something in my heart. As an adult, I must admit, my first book actually went back to my roots. I went back to that place of imaginary worlds filled with mythical creatures. I suppose it is fitting; that is where my love began. I wanted to write a fantasy story that taught children that everyone has special abilities within them, not just superheroes. While I was still penning my first work, an idea was sparked in my mind. It was the story of a young girl who saw herself as a Plain Jane. I don’t know where the words came from that initiated that novel, but I imagine that deep down inside I wanted to be able to relay to readers how harsh, cutting words wound the soul, and my character had been greatly wounded by them. Over the last five years, stories have been constantly rolling around in my head. Yes, some of them are still inspired by the inner child who wants to escape to a whimsical world, but the majority of those floating around are stories of realistic people facing the harshness of life and love. 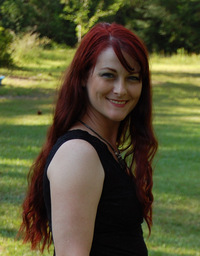 Schledia Benefield was born and raised on the Mississippi Gulf Coast. She presently lives in Big Point,Mississippi with her husband and four of her five children. She is the author of three YA novels: Plain Jane, Pretty Boy, and her newest release, Wildflowers. She also writes middle-grade fantasy under the pen name S B Scrillum. In her spare time she enjoys reading a good book, scrapbooking, sewing, spending time with her family, and visiting over a cup of coffee. Somehow I missed this, Isabel. Sorry about that! Life has been kind of crazy lately. Thank you for allowing me to share some of the craziness in my head.